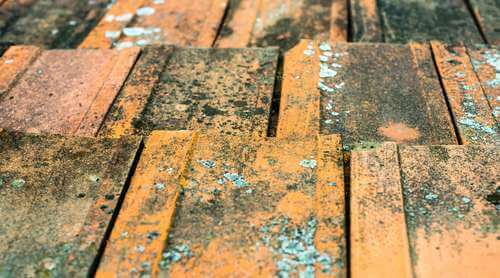 If you’re considering purchasing a property, or have just bought one that is a fixer-upper, then you need to consider that your roofing structure may very well not be everything it looks to be. Damage to your roof is not necessarily evident from the outside and, very often, when buying a home you are inheriting some roofing issues. Considered one of the top methods for roof maintenance as it allows you to uncover any leaks, clean out any blocked shingles that may lift due to compacted debris, or remove algae that will eventually lead to damp and mould. Algae is made up of tiny vermin, which find their way into the more organic roofing material, which then requires complete replacement. Cleaning your roof will save you money in the long-term because you’re regulating the roof’s ability to sustain heat and keep your home warm; maintain the value of your property, and avoid unwelcome pests, damp and dirt into a roof that should be clean and dry. Leave these ‘guests’ long enough and you may have to look at replacing your entire roof, and that is what you want to avoid. It’s all in the details and the bigger the broken details, the larger the outlay to fix. Small damages such as broken tiles, shingles and snagged waterproofing can all be dealt with immediately and effectively. Leaving these little things for too long can lead to you having to replacing your entire roof, or waterproofing that deteriorates and leads to you having to replace the entire flashing system. You can certainly gauge that you will be saving a load of money by ensuring your home is free of damp and mould, which can lead to severe health problems. Mould is known to scatter spores into the air, which cause big issues for asthmatics. Ensure that you roof is not leaking and the insulation is correctly installed. In this instance you don’t just save money, but you add to your investment. If you’re selling your home, buyers want to know that they’re getting value and that they’re not inheriting someone else’s roof issues. A bad roof will seriously devalue your home and impact your selling price. If you’re overhauling the paint job on your roof then you need to ensure you are using the correct paint when reapplying the waterproofing membrane, and the tools you are using will not break the tiles, permeate the flashing or break down the interior of your roofing. Roofing restoration and maintenance are essential to ensure your home life is comfortable and healthy, so much more than you realise. Paying close attention to the shingles, flashing, nails, vents and crevices created by all of these materials will ensure your property remains ‘healthy’ and your investment continues to grow in value. If you’re uncertain of what to look for, or if something doesn’t look right to you then contact the roofing specialists and put your mind, and your pocket, at ease.